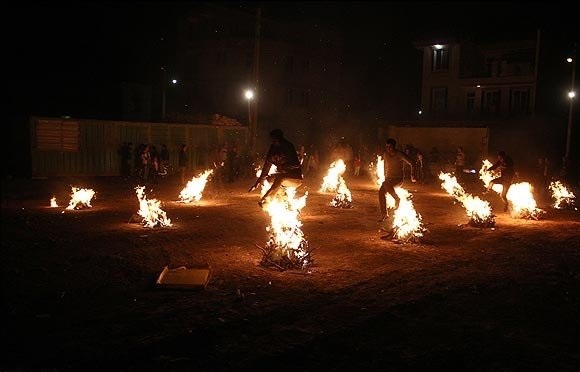 The Iranian people celebrate the Fire Festival every year as part of Iran’s ancient customs, despite heavy security measures and the Iranian regime’s abandoning the rituals. The Iranian regime is terrified that the people will use the opportunity to take it to the street and turn the festival into a large demonstration against the regime. The People’s Mojahedin Organization of Iran-PMOI (MEK) has called for the annual Fire Festival and the last week of the Iranian calendar year into a year of protests and fire against the mullahs ruling Iran. March 21st marks the Persian New Year (Nowruz), which is preceded by the annual Festival of Fire (Charshanbe Suri). The mullahs have attempted to prevent public celebrations of the pre-Islamic celebrations, but the people of Iran persist in honoring their culture in what has become an act of defiance against the repressive regime. Last year’s Fire Festival came just weeks after the December 2017 people’s uprisings, in which thousands of Iranians in 142 cities in every province took to the streets to demand the overthrow of the regime over a two week period. Despite brutal crackdowns by the regime, including the arrests of over 8,000 protesters and the deaths of at least 14 protesters in custody due to torture, protests continued in the streets of Iran. The 2018 Fire Festival became an act of rebellion for the people of Iran. 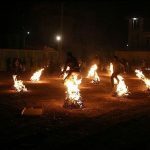 Chaharshanbeh Souri is a pre-Islamic tradition of jumping over a fire to symbolize purification and a new beginning. Nowruz is a Persian word meaning “new day.” The MEK and Iranian Resistance organized demonstrations during Charshanbe Suri and Nowruz as a show of defiance to the mullahs and a vow to the people that a new day had dawned in Iran. One year later, anti-regime protests and strikes continue on a daily basis in the streets of Iran. People from all sectors of society have joined together in calls for regime change, and chants of “Death to Khamenei!” are heard regularly in demonstrations. The MEK’s Resistance Units have used social media to disseminate news and worked on the ground with diverse groups of people to organize an opposition movement that is too powerful for the regime to suppress. The Festival of Fire is here once again, and the MEK is ready to celebrate this new beginning with another act of rebellion. The progress made over the past year cannot be denied, but there is more work to be done. Regime change is close at hand. A new day is upon us. This will be a launching pad to expand protests and the uprising throughout the New Year, at any time and any place. We can and we must take back Iran from the corrupt and criminal mullahs. The spring of victory has arrived. This most beautiful country will be free.